The man in charge of the work of building a castle was the master mason. He would design the castle and liaise with the future owner. Sometimes he would build a small 3D wooden model to show the lord what was possible. Then he was in charge of the building project itself. A castle building project required a huge workforce. Remember, this is in the days long before machinery. 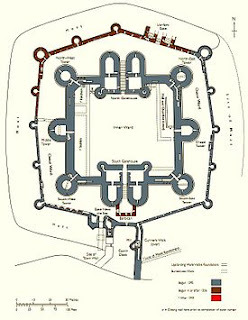 For example, the construction of Beaumaris Castle on Anglesey in North Wales in 1295 required 375 quarriers, 450 stonemasons and 1,800 workmen. The workmen included labourers to shift the earth and move the stones, men driving carts to transport the stones and other materials, carpenters, tilers, and many other trades. These also had to be housed and fed. In case you should wonder where so much money could go in a week, we would have you know that we have needed – and shall continue to need 400 masons, both cutters and layers, together with 2,000 less skilled workmen, 100 carts, 60 wagons and 30 boats bringing sea coal; 200 quarrymen; 30 smiths; and carpenters for putting in the joists and floor boards and other necessary jobs. All this takes no account of the garrison … nor of purchases of material. 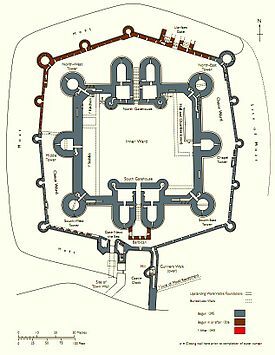 Building a castle required the master mason the be in charge of a vast army of workmen, including earthworkers to dig ditches and fortifications, dykers to divert and manage water, dig moats and water defences, and quarrymen to identify and dig out the best stone. Carpenters made winches for lifting and placing logs and scaffolding elements, laid floors and roofs, hoardings and walkways. Blacksmiths designed hinges and strapwork and made and repaired the tools used by the other craftsmen. The masons were the highest ranking craftsmen because of their ability to carve the beautiful tracery windows and the keystones for the vaulted roofs. That’s why the master mason was in charge. As well as managing the workers and overseeing the work, the master mason had to balance the books and pay suppliers and workers.